Christmas is over, the new year has begun and we need some hearty winter-warming dishes to get us through the next couple of months. What better way to cheer yourself up than with two fine specimens of vegetables colliding together in a mix of spices to create an aromatic taste explosion in your mouth? 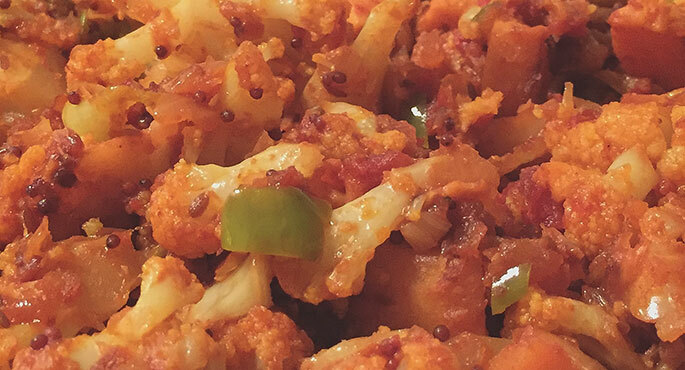 Introducing: Aloo Gobi! 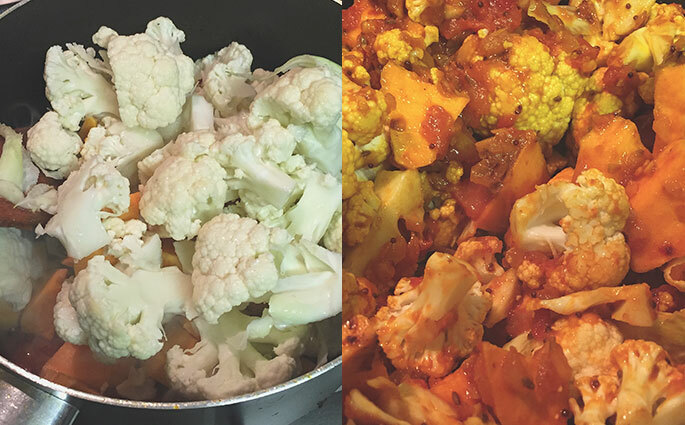 Aloo Gobi, which simply translates into Potato Cauliflower is a wonderful dish I grew up eating fairly regularly. My mum used to whip large batches together in no time for dinner which we could also enjoy again as stuffed Paratha’s (crispy fried chapatti’s) the next day for lunch. 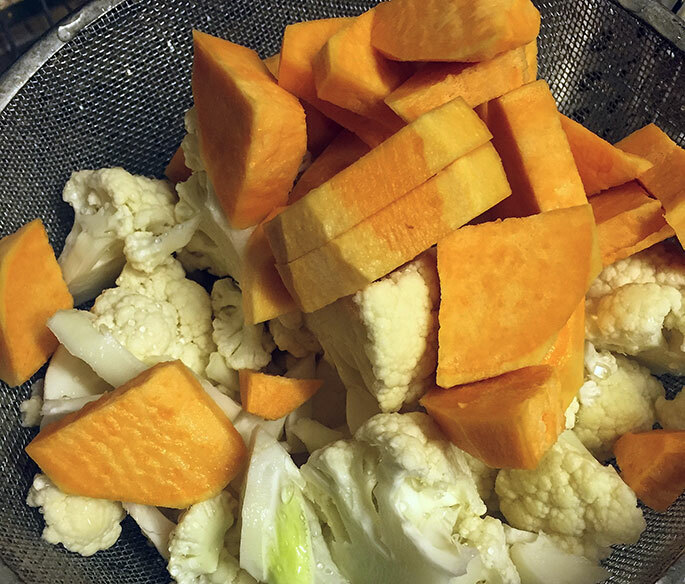 I love the flavour of cauliflower, and this is one my favourite dishes to bring this otherwise boring looking vegetable to life. (The second being cauliflower cheese of course). Traditionally eaten in Pakistan and India I’ve added a little twist to the original recipe by substituting regular white potatoes with sweet potatoes. I adore sweet spuds and they also make the final meal look as beautiful as it tastes. Serves 4 or 3 hugely hungry people. 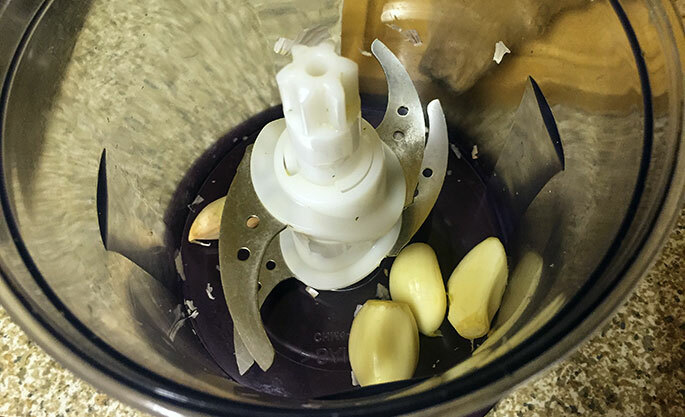 You start by blitzing together the garlic and ginger! Remember you’re going for a thumb sized piece of ginger to give this curry a real fiery kick without being too spicy. 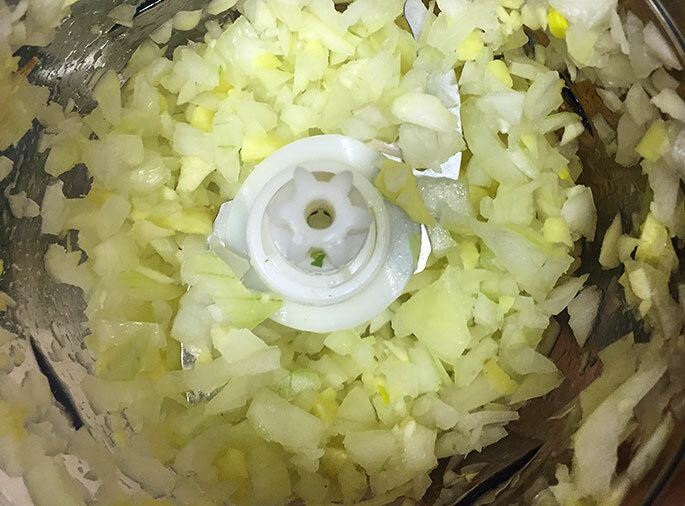 I recommend blitzing the onion separately and if you’re using an electrical chopper and it’s small like this one – do it in two half batches so the onion is evenly chopped. No big bits floating on the top and not minced to a puree either. Then plop in your choice of oil! I’ve gone for coconut oil, not only because it’s good for you but because it is so, so, so delicious. 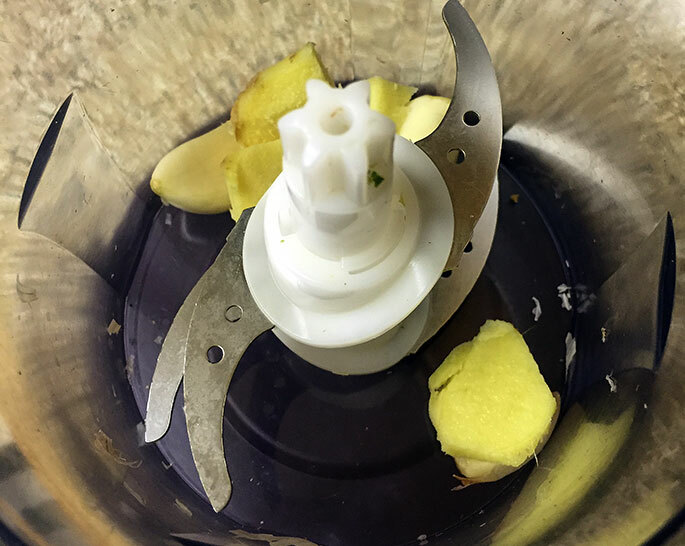 As the onion, garlic and ginger slowly brown on a medium heat get chopping with your cauliflower and potatoes! The florets are easy to cut and you’re looking to cut it all into fairly chunky pieces. 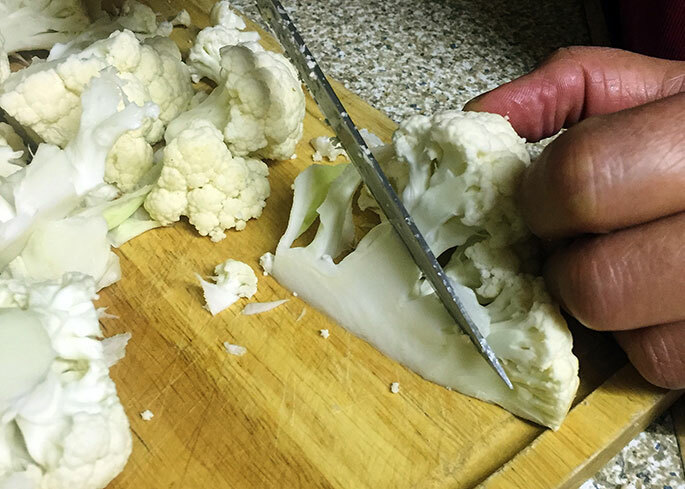 Every part of the cauliflower can be used but take care with the stalk as the texture on this is harder, meaning it will take longer to cook than the florets which will soften fast and sort of melt into the Aloo Gobi once cooked. … and dice into smaller pieces so they cook faster. Then don’t forget to give it all a wash you filthy animals! 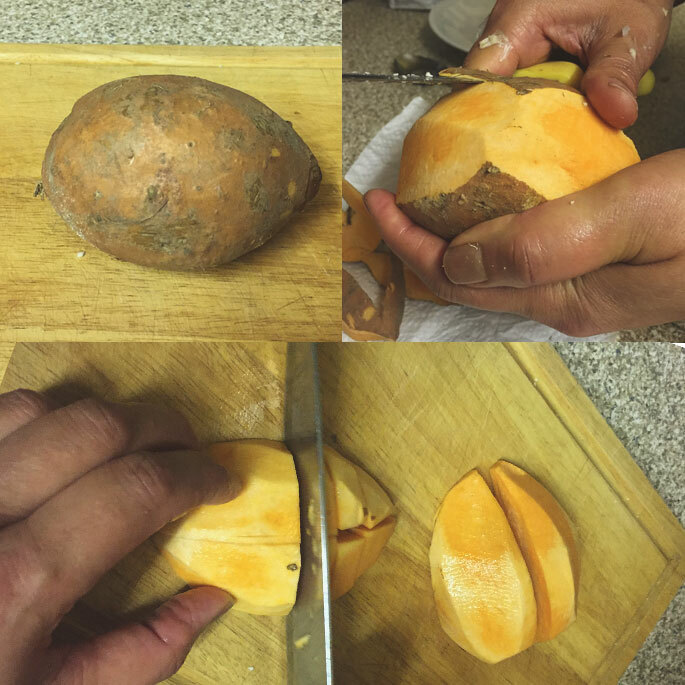 Peel the sweet potato to reveal the beautiful orange flesh. 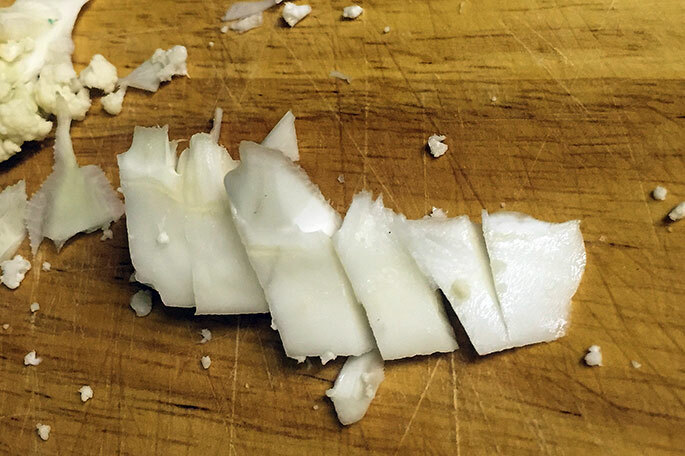 Chop – not into small diced pieces but reasonable sized chunks. 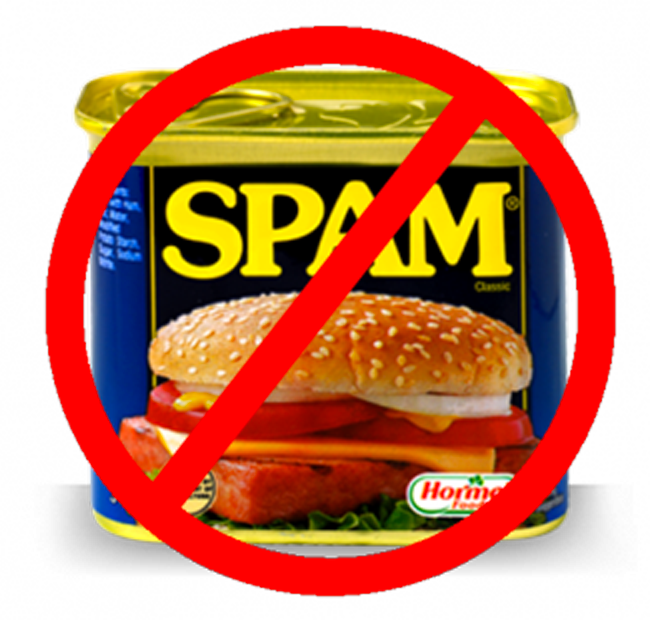 Remember, once this is all cooked down it will soften and break up. Leave the vegetables to one side for now whilst you get cracking with the spices. This is always my favourite part! I’ve got a huge spice drawer and I feel like I’m making a magic potion sometimes! 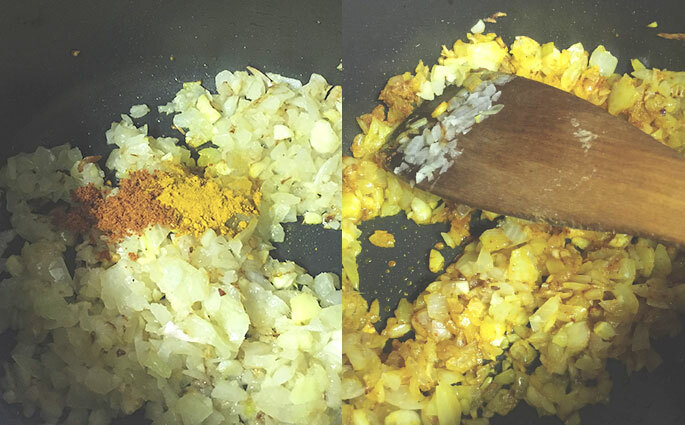 Put in the teaspoon of chilli powder and the quarter teaspoon of turmeric straight into the slightly browned and softened onion mixture. 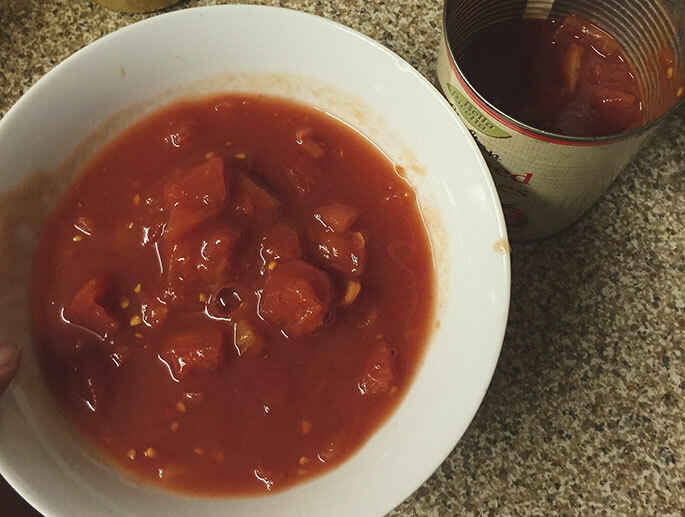 Give this a good old stir and leave to cook for a minute whilst you get half a can of chopped tomatoes ready. 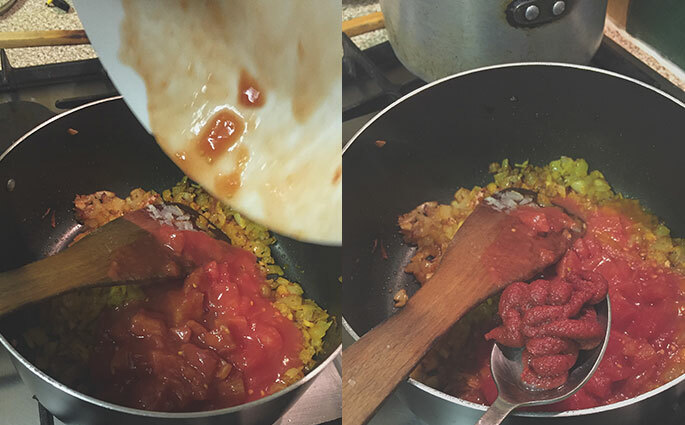 After a minute pour in the tomatoes and add your tablespoon of tomato puree too. Raise the heat and bring this all together to caramelise for around 2/3 minutes. 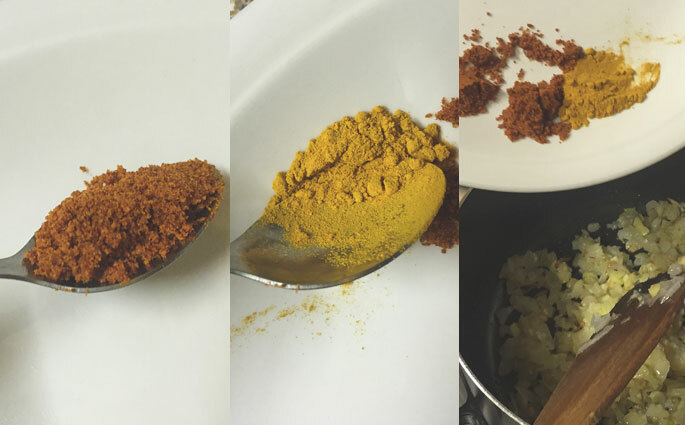 Now you can also crush in your cumin seeds. Don’t worry yourself about using a grinder (although you can use one if you really want). 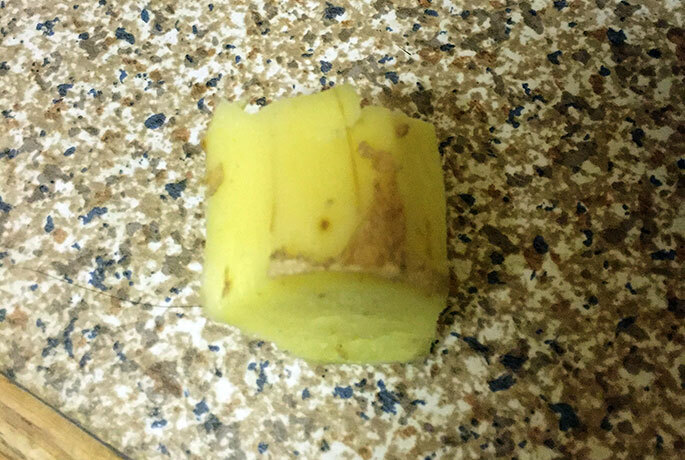 Simply grind them in the palm of your hands instead – demonstrated by my mum in the below Vine. Sure you can use pre-ground cumin, but I’ve always found that crushing it fresh leaves a sharper flavour. 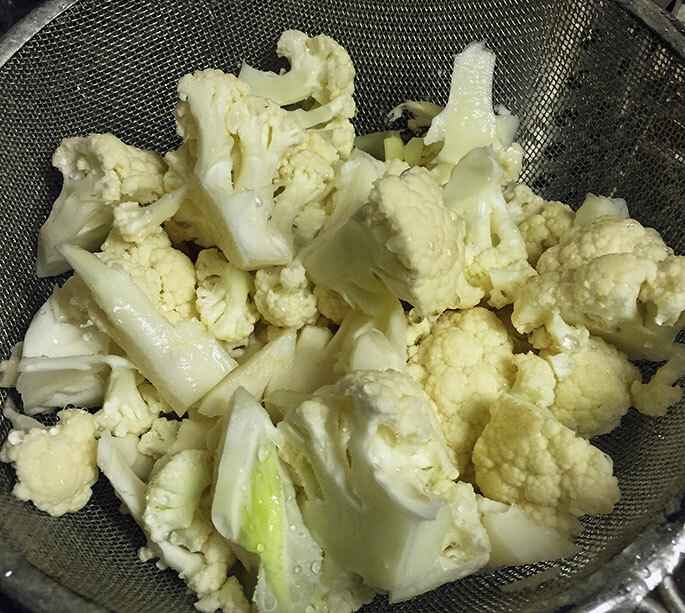 After giving all the spices a good mix, drop in the cauliflower and potatoes. Turn down the heat to low/medium and add 2 tablespoons of water. 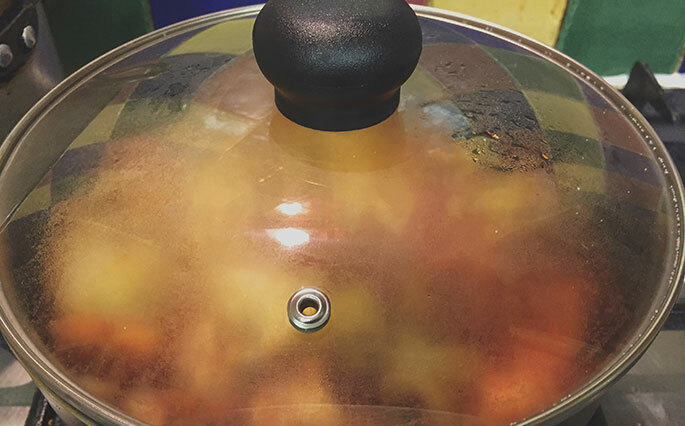 Pop on the lid, DOUBLE CHECK IT IS ON A LOWISH/MEDIUM HEAT. (No one likes burnt cauliflower). Leave for 5 minutes before you check on it again. 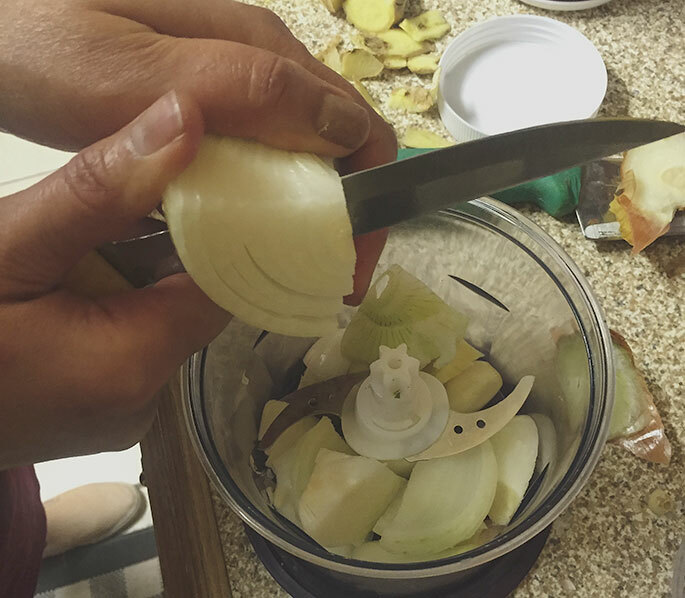 Once the time is over, open the lid and check and see if the vegetables have softened. 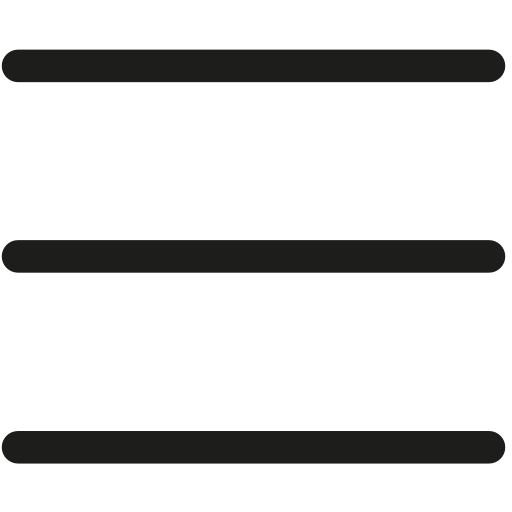 Everything should be soft, but still holding it shape and not mushy. You can also taste and check if the salt is to your liking at this stage. If everything is A-okay, drop in your chilli and coriander if you want it. Stir and let it all cook with the lid off for another 5 minutes. 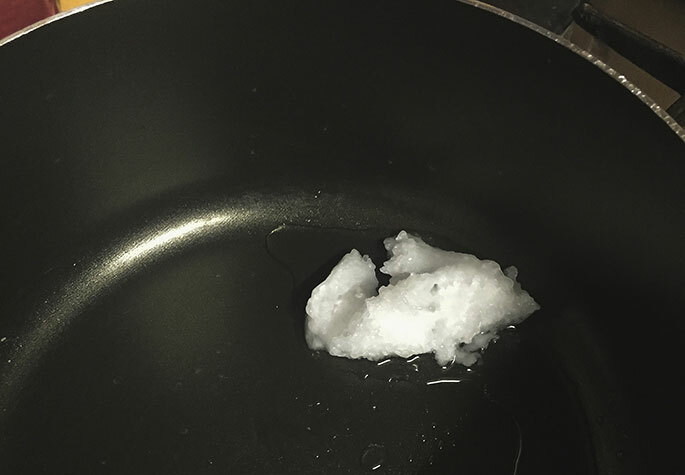 Again, make sure the heat is lowered and check on it now and again to ensure there is no sticking to the bottom of the pan. 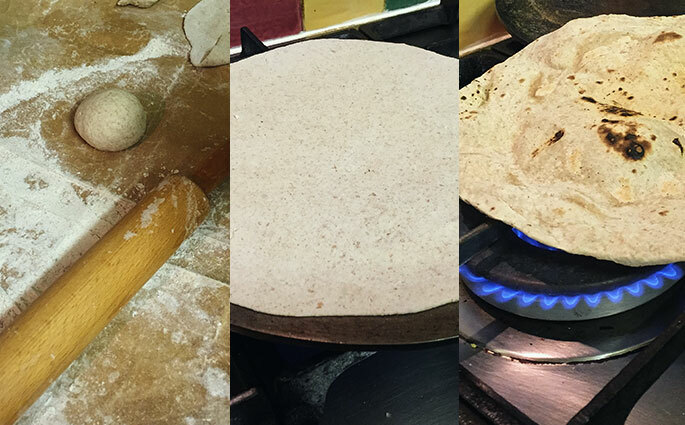 Whilst the Aloo Gobi is finishing off you can get to work on your naan or chappati’s. I’ve previously written a blog about how to make these here. You can always buy pre-made naan or simply use pitta bread which is just as delicious and makes for a quick meal! 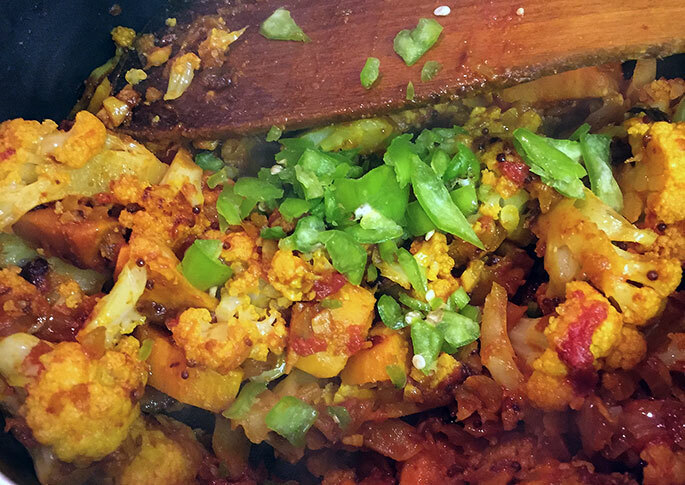 Your Aloo Gobi is ready. Serve it in a dish with warm bread of your choice and dig in. 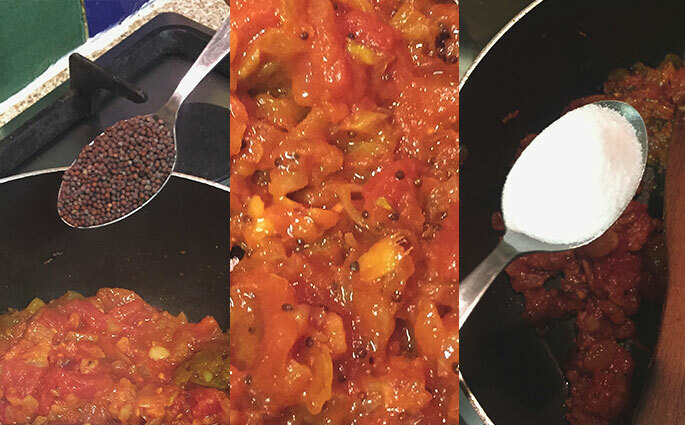 The colours in Aloo Gobi are spectacular and if you’re not great with spice you can leave out the green chilli and reduce the chilli powder too. 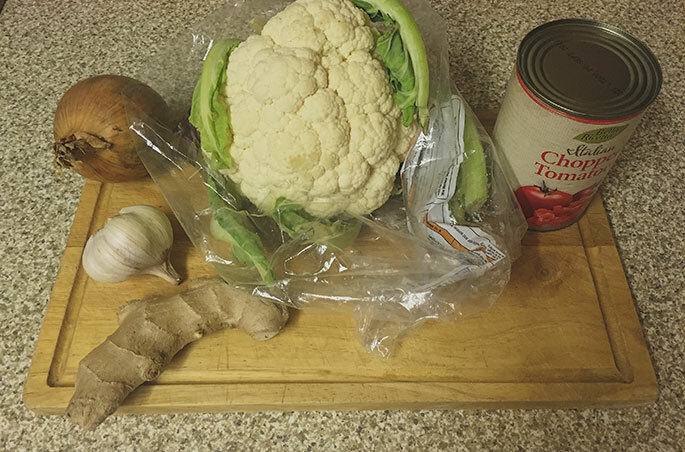 The garlic and ginger are already adding a warmth to this dish and the vegetables have such a distinct flavour that this meal tastes delicious with just basic spices and tomatoes if you prefer. 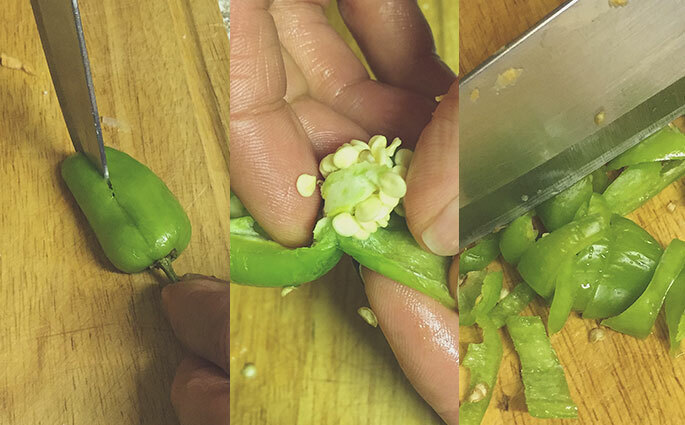 Likewise, if you would rather make it hot, hot, hot – drop in more chilli by all means! My recipe makes the heat in this dish medium to mild so don’t worry about it blowing your head off. 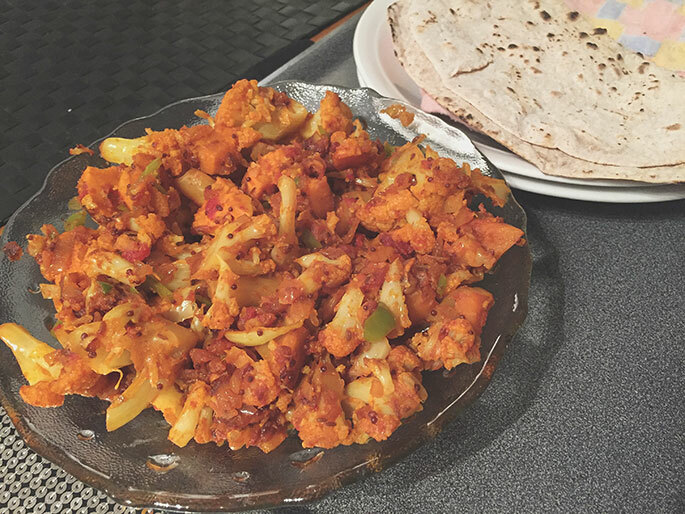 If you give this Aloo Gobi a go, please Tweet me photos on @SoWrongItsNom or let me know how it went in the comments below! 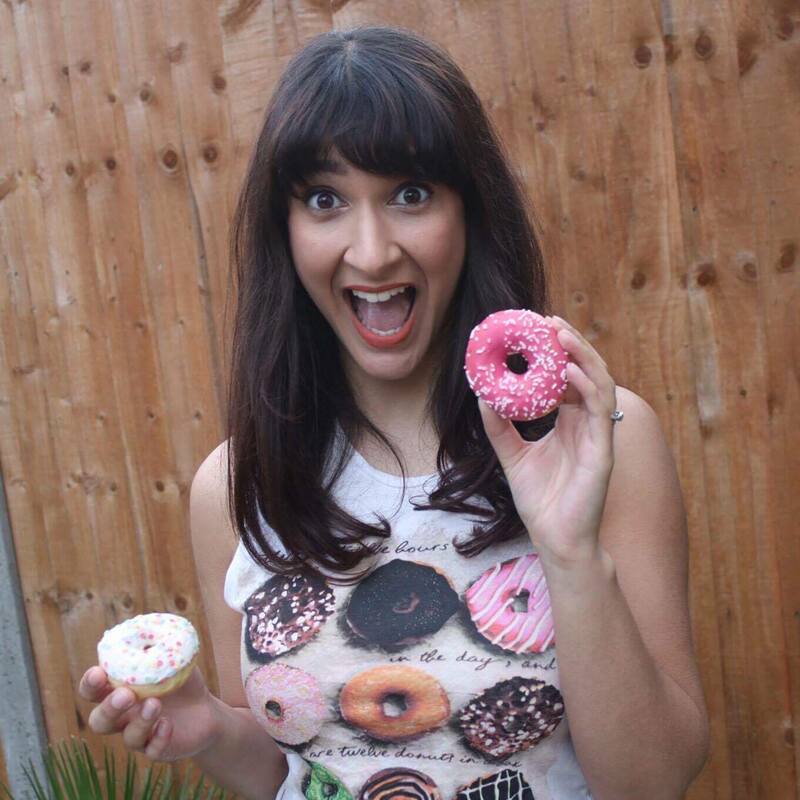 I love a good food snap.